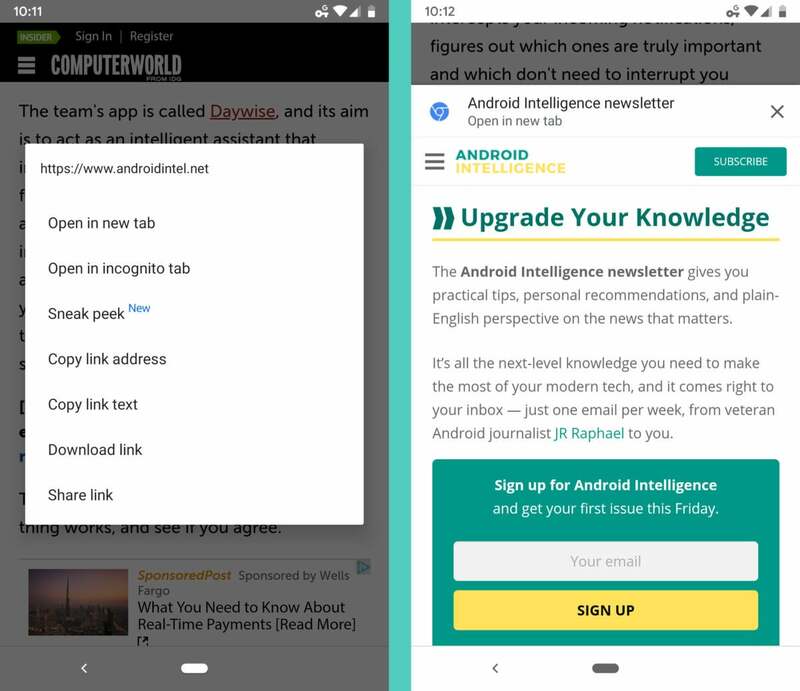 Google's Chrome Android app provides a commendable browsing experience right out of the box — but if you know where to look, you can unlock extra features that'll make it even more effective. Your phone's browser is your on-the-go gateway to this wacky ol' web of ours, after all, and whether you're doing important work-related research or (ahem) important work-related procrastination, you want to be as efficient as possible — right? Well, look no further: The seven settings outlined below are all about enhancing your productivity and eliminating browser-oriented annoyances that slow you down. What's more, the flags system has a ton of options within it, some of which could potentially cause websites to look weird, Chrome itself to become unstable, or even your ears to start spewing a delightfully minty steam. (Hey, you never know.) So in other words: Proceed with caution, follow my instructions carefully, and don't mess with anything else you encounter in Chrome's flags section unless you actually understand it and know what you're doing. Got all that? Good. Now, let's give your browser some spiffy new superpowers, shall we? Chrome's address bar (a.k.a. the Omnibox) is the starting point to most of what you do in your browser — and with a teensy bit of tweaking, it can become even easier to use. A setting in Chrome's flags system changes the address bar's default behavior so that anytime you tap it, it automatically clears your current URL and gives you a blank space for typing — along with a quick 'n' simple shortcut for copying or sharing a link to the current page you're viewing. It's a subtle shift, to be sure, but it's pretty darn sensible — and little things like this can add up to make a big difference. To give yourself the upgrade, type chrome://flags into your browser's address bar and then type omnibox into the search box at the top of the screen that appears next. Look for the item on the page labeled Search Ready Omnibox (which'll probably be the top result). Tap the box beneath it and change its setting from "Default" to "Enabled." Now just tap the blue "Relaunch Now" button at the bottom of the screen — and go bask in your newfound efficiency. 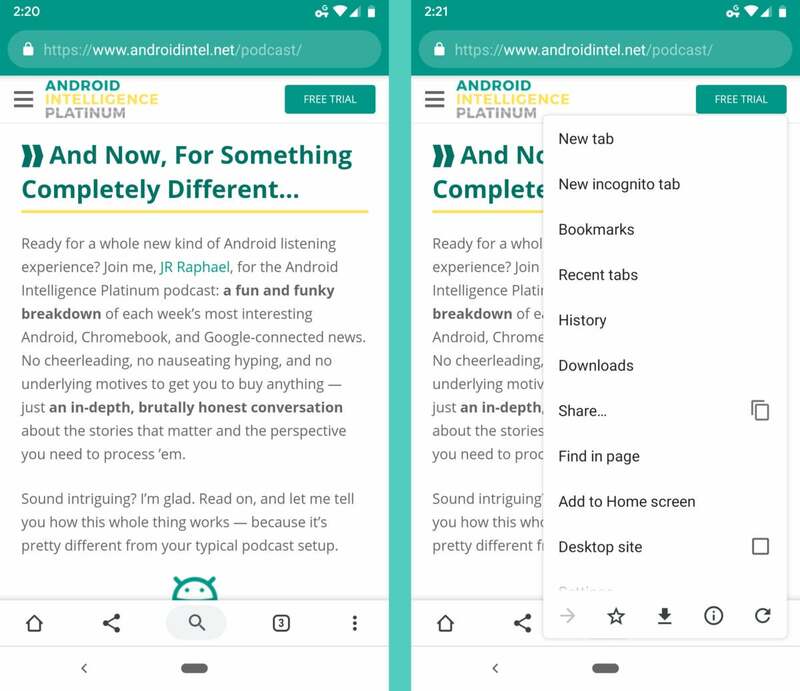 Next, another worthwhile tweak to the Chrome Android address bar — one that's similarly subtle but equally effective, especially if you aren't using the previous option. This hidden setting adds a microphone icon into the address bar so you can always search by speaking without having to move your finger far or scan around to find the equivalent icon in your keyboard. Having that microphone icon right there where you're already tapping makes an awful lot of sense, doesn't it? 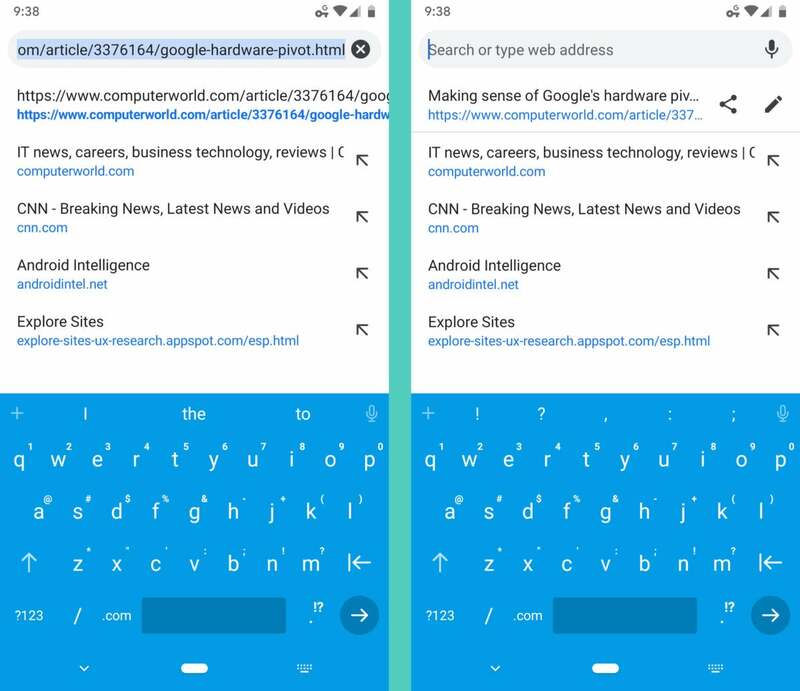 To add it into your phone's browser, once again type chrome://flags into Chrome's address bar, then type omnibox voice into the search box and look for the Omnibox Voice Search Always Visible item. Just as you did a second ago, tap the box beneath that beauty and change its setting from "Default" to "Enabled," then tap the blue "Relaunch Now" button at the bottom of the screen and sing a happy little ditty. You know when you're looking at a web page and you wanna open a link without navigating away from the main page you're viewing? You usually have to go through the clunky process of opening the link as a new tab, switching over to that tab, looking at the newly opened page, then closing it and going back to your original tab. Well, stop that silliness immediately, you silly ol' salamander, for Chrome has a much better way to handle this. It's a supremely useful sneak-peek panel that pulls up any link in an overlay atop the page you're viewing. You can swipe the panel up or down to view more or less of the secondary page — and if you eventually decide you want to send the page into its own tab, you can do that with a single tap, too. But if you don't, you can go on basking in the glow of your original page without any real interruption. To add the option into the Chrome Android app on your phone, again type chrome://flags into the address bar — and this time search for ephemeral. Look for the delightfully named An ephemeral tab in an overlay panel option (seriously, that's downright poetic, isn't it?) and then tap the box beneath it, change its setting to "Enabled," and tap the "Relaunch Now" button at the bottom of the screen. And with that, you did it! (Go ahead and give yourself a quick pat on the back, would ya?) From now on, you can open up any web page, press and hold a link, and look for the "Sneak peek" option to experience the joy of in-browser multitasking. 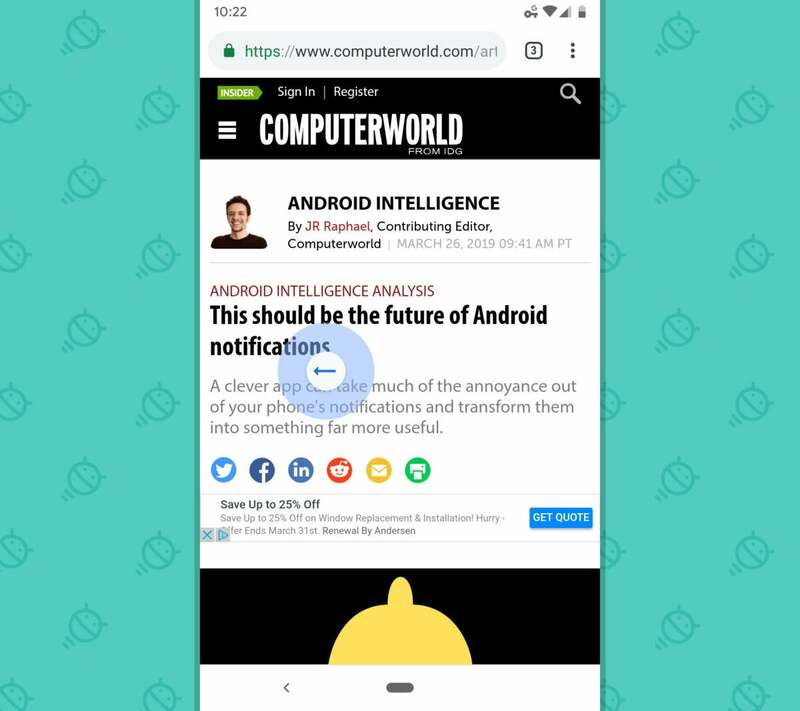 The desktop version of Google's Chrome browser has a handy hidden gesture that lets you swipe to the left in any tab to move back one step in your browsing history or swipe to the right to move forward (assuming you're using a computer with a touch-ready screen, of course — otherwise, swiping around on it will just smudge up your monitor and make you look like a ninny). Well, you'd never know it, but the Chrome Android app can do that, too — if you know where to find the hidden setting. And now you do: It's in that same chrome://flags section of the browser we've been looking at (good golly, imagine that!). Open up that page and search for history nav, then find the option labeled History navigation with gesture and change it from "Default" to "Enabled." Hit the "Relaunch Now" button, then navigate through a few random pages and try swiping your finger to the left or right in the main area of a tab. When you do, you'll see an arrow pop up on the screen and point in the appropriate direction. Lift up that lovely fingie of yours, and shazam: You'll pop back or forward one step in your browsing history — no precise button-tapping or menu-surfing required. 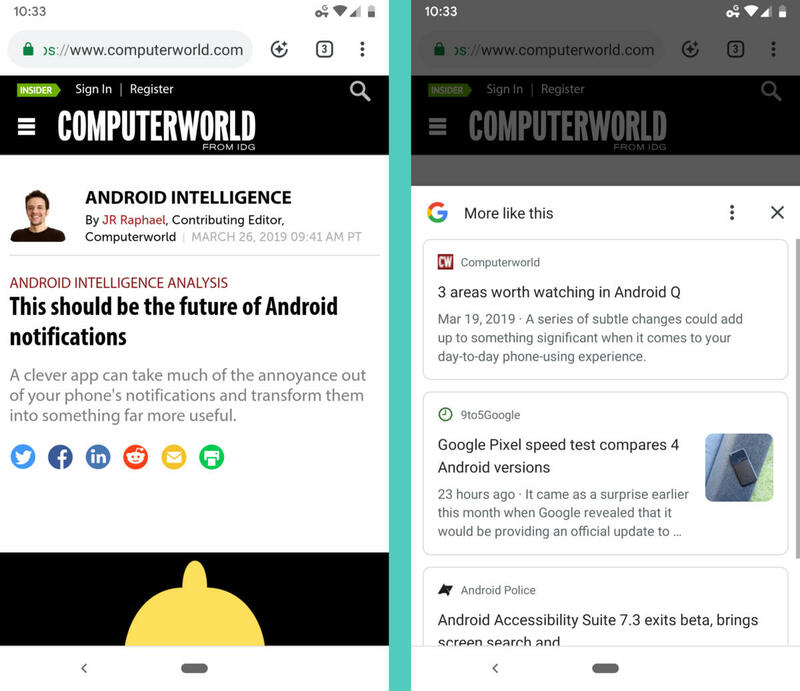 For a while now, Google's been toying around with an updated Chrome Android interface that's more geared toward single-handled smartphone use — especially for those of us with larger devices. And you know what? The current incarnation of the experiment is actually pretty darn pleasant to poke around on. 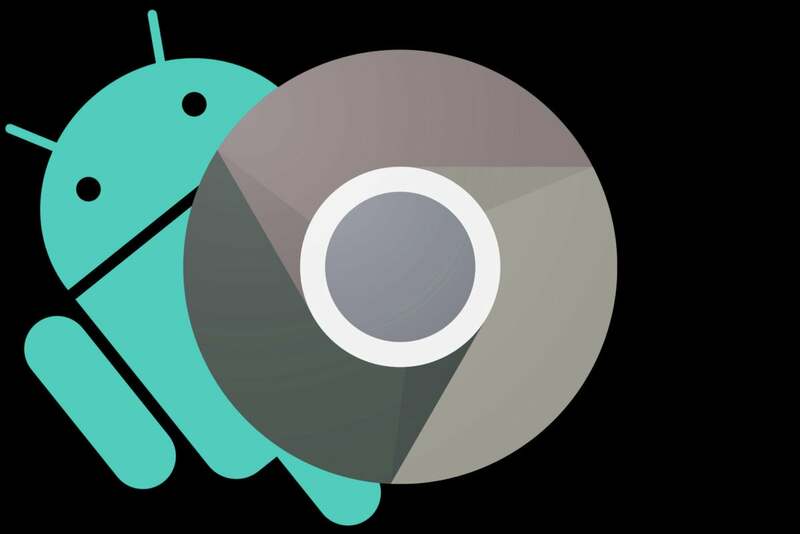 It's called Chrome Duet, and it moves the main browser interface — the commands you interact with most often — to the bottom of the screen instead of leaving them in their usual home at the top. That way, they're easier to reach without having to shift your phone around in your hand like a floppy ol' floundering fish. The adjusted setup takes a little getting used to — and it's definitely not for everyone — but it's at the very least worth trying to see if it makes your days just a little bit sunnier. March your way back into that chrome://flags page, search for duet, and then flip the setting on the Chrome Duet option from "Default" to "Enabled." Smack that "Relaunch Now" button — and this time, you'll also have to open your phone's Overview screen (the app-switching interface you get to by tapping the square-shaped button next to Home or by swiping up on the Home button, depending on your Android version) and then swipe Chrome away to close the app completely. After that, go reopen Chrome from your home screen or app drawer, and the snazzy new Duet mode should be there and eagerly waiting for your gentle caresses. This next one really rides the line between "useful" and "obnoxious," so you'll have to check it out and see whatcha think — but the Chrome Android app has the ability to give you Google-generated related content recommendations that can, in theory, lead you to additional articles you might appreciate about subjects of interest. 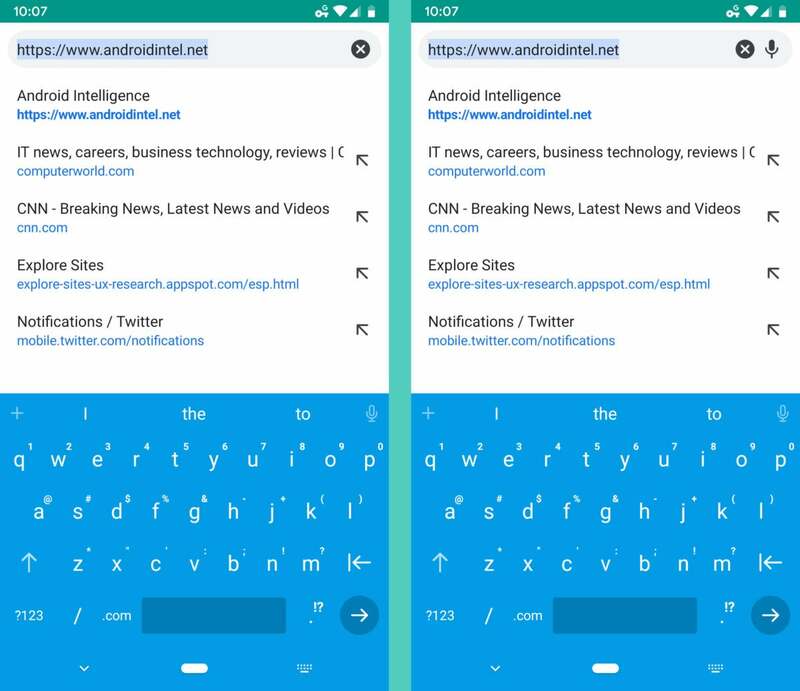 What it does is add a new button into the Chrome address bar that pulls up recommendations for pages you might want to view next, based on what you're currently reading. You can give it the ol' college try by going back to that familiar chrome://flags page, searching for contextual suggestions, and then changing the setting for Contextual suggestions buttons from "Default" to "Enabled." Hit the blue button to restart your browser and head over to an article (this very one, even, if you're feeling especially Escher-esque) to see what comes up. Let's be honest: No one likes autoplaying videos, especially from a mobile device. So take back control and change Chrome's default behavior so that websites (cough, cough, none in particular) can't give you those unwanted interruptions. For this one, we'll head into the regular Chrome settings page — by tapping the three-dot menu icon in the app's upper-right corner and then selecting "Settings." Open the "Site settings" section, tap "Media," and then tap "Autoplay." 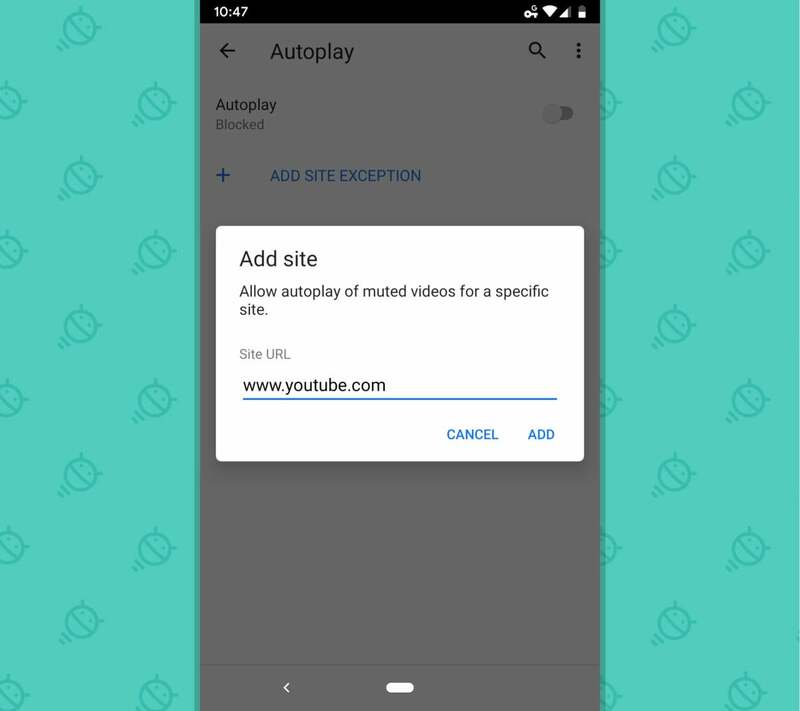 Next, tap the toggle at the top of the screen so that it's set to the off position — and finally, if you have any specific sites where you do want to let autoplaying occur, tap the "Add Site Exception" option and add them into the list. Ahh — the sound of silence. Ain't it grand?